Klear Screen safe For Computer screens, iPads, iPhones & More. 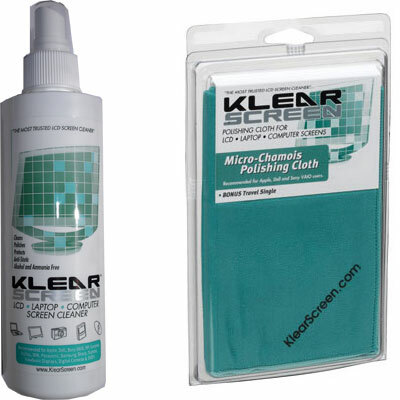 Klear Screen Microfibre Chamois Polishing Cloths are high quality, optical- grade, ultra - soft polishing cloth & are washable & reusable. One (1) 240ml Klear Screen non-aerosol pump spray bottle provides approx 1200 applications. One (1) Large optical-grade ultra-soft microfibre chamois polishing cloth of 400mm x 400mm size (16" x 16").